1 Bottle Raspberry Ketone Capsules & Serum + 2 Acai Gold + 5 FREE T5 Patches! What is BioPharmX™ Raspberry Ketone? Raspberry Ketone is fast becoming known as one of the most powerful fat burning and detox products out there. With BioPharmX™ Raspberry Ketone never before has such a powerful Raspberry Ketone formulation been available using only the finest and most potent premium grade Raspberry Ketone extracts possible. No half measures have been taken - from the ground up this has been formulated as the most cutting edge Raspberry Ketone product on the market. BioPharmX’s premium quality formulation contains 100% pure and highest possible quality graded Raspberry Ketone extract (600mg per serving) far exceeding the dosage proven effective in clinical studies. Manufactured in the UK to the highest pharmaceutical standards, BioPharmX™ Raspberry Ketone is the ultimate Raspberry Ketone. Quite simply, you have not experienced the full power of Raspberry Ketone until you have experienced this ultra potent, award winning formulation. BioPharmX™ Raspberry Ketone will enhance overall health and promote staggering fat burning capabilities. The specially selected natural amino acid polypeptides have exceptional properties which are proven to increase the production of Adiponectin, which is an essential weight loss hormone. Adiponectin enhances your muscles ability to use carbohydrates for energy while stimulating and enhancing metabolic rate. BioPharmX™ Raspberry Ketone is also proven to stimulate thermogenesis which slightly increases heart rate and other bodily functions in turn triggering the release of glucose and fatty acids from energy stores which can cause a slight rise in body temperature, all of which are beneficial for promoting extreme fat loss. The formulation also contains a precision 200mg of Caffeine Anhydrous per capsule to further aid metabolic processes and ensure that you experience the intense results even faster. 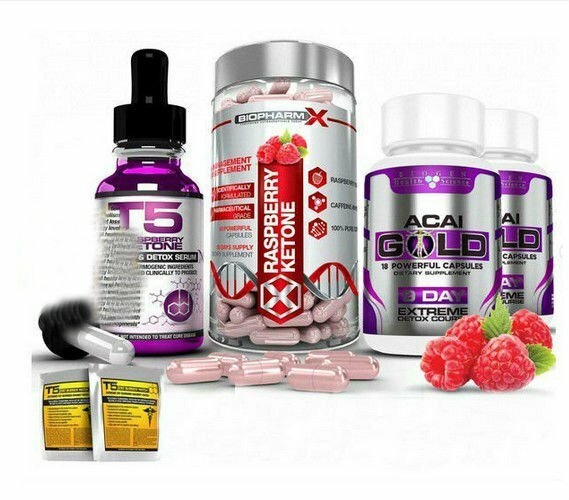 This ultra potent raspberry ketone formulation massively stimulates fat loss and regulates metabolism while also providing a host of additional health benefits. When using BioPharmX™ Raspberry Ketone you can be assured that you will receive the astounding fat burning and weight loss properties, as well as a host of Detox benefits with absolutely no side effects. BioPharmX™ Raspberry Ketone is formulated from nature’s best, containing only the highest grade natural pharmaceutical quality ingredients, with a blend of highly concentrated natural raspberry enzymes – within the safe recommended dose. All ingredients have undergone rigorous scientific testing and been proven fully effective for the benefits highlighted. Raspberry ketone is a natural phenolic enzyme found within raspberries and is the principal compound that gives red raspberries their natural aroma. When the enzyme is extracted from the raspberries it has been scientifically tested and results have proven that raspberry ketone promotes astounding weight loss including reducing FLD (fatty liver disease) and rapid Detox properties. BioPharmX™ Raspberry Ketone increases metabolic rate by increasing the body’s core temperature and in doing so hugely increases the body’s fat burning capabilities. Furthermore, the enzymes are full of antioxidants which also help to reduce the amount of dietary fat absorbed by the body. It would be impossible for someone to ingest the number of raspberries to receive the same natural fat burning effect that one single dose of highly concentrated BioPharmX™ Raspberry Ketone is formulated to give! A whole 90lb of raspberries would have to be ingested per day to receive the same effect; furthermore the total sugar consumption would be counterproductive. Increased fat breakdown (the hormone androgen inhibits the ability of some fat cells to store lipids by blocking a signal transduction pathway), increased energy expenditure (the hormone leptin is a key hormone in regulating energy expenditure and energy intake) and increased lipid metabolism (the hormone adiponectin is a primary hormone that regulates a number of metabolic processes) – are all effects and hormones that are stimulated directly from the action of raspberry ketone – by altering the lipid metabolism and increasing norepinephrine induced lipolysis in white adipocytes. Who should use BioPharmX™ Raspberry Ketone?